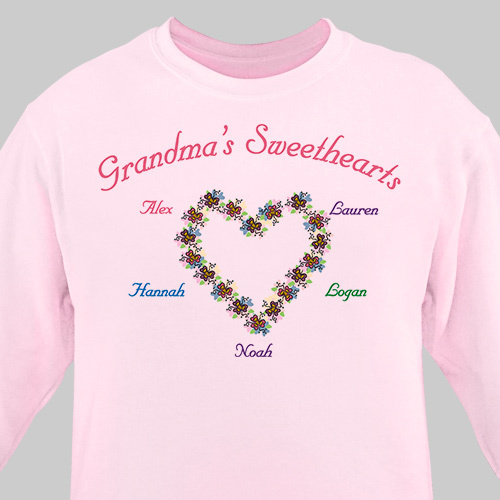 Show off who loves you with our Personalized Sweethearts Sweatshirt. Now Grandma, Nana, Mom, Granny and even your Sister can proudly show off the whole family on this attractive and comfortable sweatshirt. Our Personalized Shirt is available on our premium white cotton/poly blend sweatshirt, machine washable in adult sizes S-3XL. Includes FREE Personalization. This Personalized Sweetheart Sweatshirt allows up to 30 names with any personal title. Will give as a gift (in pink) for Mother's Day. Good quality sweatshirt with 19 names. We keep adding names to keep current. This will be the 5th time we've ordered a "Grandma" sweatshirt. She loves them. The explaination of the printing ink color was not sufficent.the colors are not brilliant enough to show up on the shirt. The design is nice but, the names are in random colors and a few of the colors are really light and they are very hard to see on the white sweatshirts. The names in the darker colors are alot bolder and over power the light color names. Looking for the perfect Valentine’s Day shirt for Mom or Grandma? We have Valentines Day shirts, Mom Shirts, Grandmother shirts, Grandma shirts, even Granny shirts, and shirts for Moms, shirts for Grandmothers, shirts for Mothers and shirts for Grandmothers. Check out all our Valentine's Day Personalized Apparel today. GiftsForYouNow.com has many Custom Printed Sweatshirts for every gift giving occasion. Create a personalized sweatshirt gift today and we will personalize it for FREE.